Since 1987, “Final Fantasy” has had a huge cultural impact on the video game industry. That has a lot to do with the artwork. One of the people behind the artwork is Yoshitaka Amano. “The Sky: The Art of Final Fantasy” showcases his “Final Fantasy” illustrations. They show why he is a master of his craft. This book is a Final Fantasy fanatic’s dream come true. 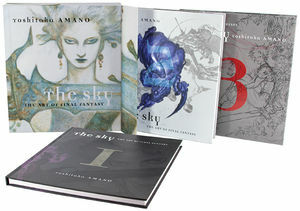 “The Sky” is a three volume art book featuring art from “Final Fantasies I-X.” Volume one has I-III, Volume 2 has IV-VI and Volume 3 has VII-X. They all have Amano’s signature style featuring both colored and pencil drawing. Each have illustrations of characters, landscapes and enemies. The illustrations for “Final Fantasies I-VI” will be familiar to fans as they have been in featured as game covers and in the game manuals. The extra illustrations range from okay to absolutely gorgeous. The ones that are worth looking at are the characters, landscapes and the black on red background drawings of monsters. Those really show off Amano’s skill. One interesting extra for “Final Fantasy VI” is where Amano draws every character as a child (which is a double negative for Gau and Relm as they already are children.) You can’t help but say “aww” as you look at them. That is, except for Kefka. He looks more demented and scary then cute. Seeing as how Amano left Squaresoft after “Final Fantasy VI,” he did not do any illustrations for any “Final Fantasy” games after that. That is until now and they hold up to the standard that of the previous “Final Fantasies.” To say these characters look better than their video game counter parts is an understatement. The best out of the bunch has to be Tifa. Amano only used two colors for Tifa’s illustration: red, white and grey and they work perfectly. Some people may object to Amano making Tifa’s hair white instead of black, but, from an artistic perspective, it works perfectly and the end result is flawless. There are some downsides to the art book though. Firstly, “Final Fantasy VII’s” section is lacking. There are only 16 illustrations in that section that mostly consist of Cloud and Aeris. Sephiroth only has one illustration, as does Tifa, Barret and Red XII. The other characters are nowhere to be seen. This volume also has way too many illustrations of “Final Fantasy IX” and “Final Fantasy X” while the other volumes had about equal parts of each game. In all, “The Sky” showcases some great art by one of Japan’s greatest artists that both “Final Fantasy” fans will love and art enthusiasts will find value in. Amano’s unique art style and great skill in both color and pencil should be the main draw to this collection.